sustainability benefi ts of reduced greenhouse emissions. (Photo: Caterpillar). Energy quality and security are not problems for every mine, particularly mature operations surrounded by ample infrastructure and served by established utilities. However, even mines located in those favorable environments can encounter diffi culties, as illustrated by the South African mining industry’s ongoing troubles with adequate supply from the country’s largest electricity producer. New mines in off-the-grid areas are often restricted to a single choice for power supply: diesel-fueled generating plants, which bring with them inherent problems of fuel transport and supply, fl uctuating costs and environmental impact. So, like the fl ywheel concept designed into the latest RE-fueled microgrids, power from renewable sources is gaining momentum. According to a report published by REN21 (Renewable Energy Policy Network for the 21st century — a global RE policy multistakeholder network), an estimated 147 gigawatts (GW) of renewable power capacity was added worldwide in 2015, the largest annual increase ever, while renewable heat capacity increased by around 38 gigawatts-thermal (GWth), and total biofuels production also rose. This growth occurred despite slumping global prices for all fossil fuels, ongoing fossil fuel subsidies, and other challenges facing renewables, including the integration of rising shares of renewable generation, policy and political instability, regulatory barriers and fi scal constraints. The emergence of RE is even more signifi cant when measured against the current cost of diesel fuel. As this issue went to press, the price of a barrel of oil was hovering at its lowest level since roughly April 2004 — seemingly giving diesel a formidable economic advantage over RE, at least in the short term. However, improvements in availability, effi ciency — and most importantly, cost — are making the RE alternative an increasingly appealing choice for mine operators that may be facing supply problems, higher prices through cross-industry competition for power from fi nite generating sources, and concerns over the environmental impact of large-scale usage of hydrocarbon fuels. And, as addressed later in this article, mining companies with extensive land holding are taking closer looks at putting unused tracts to good use by installing RE systems that add to the mine’s power security while often benefi ting nearby communities as well. Although RE encompasses everything from biomass to ocean energy sources, the solar photovoltaic (PV), concentrating solar power (CSP), also known as solar thermal electricity, and wind-power technologies have dominated most of the newsworthy developments in mining-industry RE adoption. Solar PV added 25% more capacity to its global market from 2014 to 2015, while wind power grew by 22% during the same period, reaching a world total of about 433 GW of capacity. Worldwide, the mining industry is currently credited with having just under 1,000 megawatts (MW) of installed renewable energy capacity. 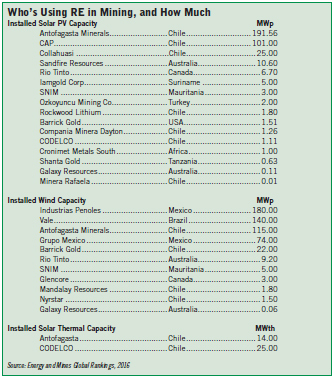 The table on p. 33, published by Energy and Mines, a renewable-energy resource website and conference organizer, provides a glimpse of industry RE users and facility locations. In a recently published online paper, experts from Black & Veatch outlined additional factors driving mining’s growing interest in RE. B&V provides energy-related consulting, engineering and management services to a wide variety of global industries, including mining. Capital costs are associated with adding renewable energy to the mix, Gibson noted, but investing upfront capital may generate overall cost savings, in addition to sustainability benefi ts of reduced greenhouse emissions. Depending upon the specifi c location and availability of solar and wind power, low- to medium- penetration renewable power systems can be integrated with diesel power to meet 10%–30% of the mine’s energy demand. This results in a direct fuel cost savings and a reduction in the number of fuel deliveries required. The mining operation will realize lower risk and more certain energy cost forecasting, offsetting the upfront capital cost, Gibson said. Benefi ts of incorporating renewable energy into a site’s operation will depend on numerous factors. Chris Mertes, a renewable energy consultant for B&V, offered a hypothetical example: A remote mine site may have an average power demand of 5 megawatts, or about 44 million kilowatt-hours (kWh) per year. If one assumes energy generated using diesel costs of $0.30 per kWh, the total energy cost for the mine may be approximately $13 million per year. Integrating wind power to generate 15% of the site’s energy supply — or about 6.57 million kWh — at $0.10 per kWh would result in a roughly 10% savings in overall energy costs. Lack of information, which can include lack of awareness of renewable opportunities, lack of data about costs vs. savings, and a communications/relationship gap between mining fi rms and RE system developers. Lack of “demand pull,” referring to obstacles inherent in current mining industry management culture, operational mindset, and lack of internal resources, etc. Capital and risk concerns, focusing on power contract structure, accounting and balance sheet issues, lack of awareness of or access to third-party fi nancing. Complexity, referring to the almost universal uniqueness of individual mine sites, along with regulatory risks and uncertainties and real or perceived technical barriers. • Reach, by 2018, a point at which fi ve major mining companies have established and are implementing ambitious renewable energy integration plans for a total of 3 GW of installed capacity. • By 2025, have renewable energy sources supplying 15% of the mining industry’s electricity, representing 30 GW of cumulative installed capacity. Sunshine for Mines said it has partnered with DNV-GL, a Norway-based major renewable energy consultancy, to offer feasibility assessment and procurement assistance, and is working toward completion of its fi rst project with Gold Fields in South Africa. Dr. Tsakani Mthombeni, group head of carbon and energy at Gold Fields, told the ICMM webinar audience that Gold Fields’ commitment to renewable energy is supported by top management — a critical factor for success — and, in part, is focused on achieving 20% renewable energy generation on average in all new mine developments. It shares the goal of supporting industry-wide change with CWR-RMI’s Sunshine for Mines program, and Mthombeni said Gold Fields’ involvement in the program could be useful for pointing the way for other mining companies to follow, specifi cally in developing methods to tackle the common obstacles listed above. For example, “lack of information” could be overcome by creating a proof point for cost effectiveness; capital, risk and complexity concerns might be alleviated by establishing a standardized process and approach; and lack of demand pull could be reversed by using the Gold Fields case study to inspire other companies to participate and adopt RE programs. In addition to Gold Fields, other major producers have invested, or plan to invest, in substantial RE programs, either as stand-alone projects or in concert with larger energy-effi ciency projects. On a broad scale, Barrick Gold has worked with Deloitte to assess the risks of its current energy mix, develop a global emissions profi le and pinpoint areas where emerging GHG or climate policies will impact its operations from a carbon pricing perspective. As part of the initiative, the company will be pursuing opportunities for reduction, including energy contracts, fuel management, renewable energy, waste heat recovery and fuel substitution. Barrick said it approaches energy demand management at a systemic level, rather than as a collection of separate processes. That means energy use in some areas (such as blasting) may rise to allow systemic energy intensity to fall (i.e., by reducing energy use downstream). Energy analytics also features prominently, with the company measuring its energy use across every subsystem to set baselines, identify opportunities for improvement and validate its actual savings over time. Elsewhere, in March Iamgold announced the signing of a power purchase agreement involving Iamgold Essakane SA, Eren Renewable Energy SA, Aren Energy and Essakane Solar SAS to begin development of a $20 million, 15-MWp solar power plant in 2017 for the company’s Essakane mine in Burkina Faso. The agreement is for an initial period of up to 15 years. Jointly owned by Iamgold (90%) and the government of Burkina Faso (10%), Iamgold Essakane SA, which owns and operates the Essakane mine, produces more than 400,000 oz of gold per year. Essakane Solar SAS, a local entity created by the project developers, will operate the solar power plant that sells the energy to the Essakane mine. Iamgold noted that with the transition to processing harder ore, energy consumption at the Essakane mine has increased from about 14 GWh/month in 2013 to 26 GWh/month in 2015. In light of this, Iamgold Essakane SA decided to partner with African Energy Management Platform (AEMP) and global renewable energy independent power producer Eren Renewable Energy SA, to construct solar capacity to complement the existing 57- MW heavy fuel oil (HFO) power plant. In the project’s fi rst phase, 15 MWp of solar capacity would be built and the hybridization of Iamgold Essakane SA’s HFO power plant will allow savings of approximately 6 million liters of fuel and a reduction of 18,500 mt of CO2 per year. In the U.S., Nevada Copper Corp. recently struck an agreement with NV Energy to conduct a study of the potential to develop a solar energy generation project on Nevada Copper’s privately owned land in southwest Nevada, near the town of Yerington. This land is adjacent to the company’s proposed Pumpkin Hollow copper development project. Depending on the ultimate scope of the Pumpkin Hollow copper mine development, the company estimates that 2,000-4,000 acres of land adjacent to, and outside of, the area of proposed mine facilities could be utilized for solar generation. If found to be feasible, a solar power development could be developed as a stand-alone operation, or as part of the proposed copper mine development at Pumpkin Hollow. Solar power doesn’t have the mining market all to itself, however, as a number of companies have invested signifi cantly in wind-power technology. Antofagasta plc, which operates several copper mines in northern and central Chile, noted that in 2015 energy accounted for approximately 15% of total operating costs for its mining division — and total energy demand was expected to rise as production expanded, transportation distances increased and ore grades declined. 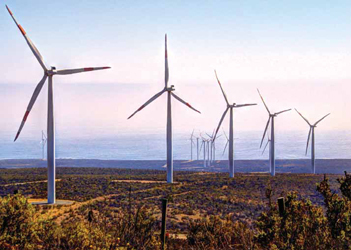 • El Arrayán, the largest wind farm in Chile with an installed capacity of 115 MW, operated by Pattern Energy. El Arrayán provided approximately 20% of Los Pelambres’ energy in 2015 and operates under a long-term PPA. • The Javiera PV solar farm in the Atacama Desert, operated by SunEdison. The farm has an installed capacity of 69.5 MW covering a site of 180 hectares and supplies Los Pelambres with approximately 10% of its total energy requirement. Antofagasta noted that by the end of 2015, its biggest operation, Los Pelambres, was being supplied with 33% of its energy from renewable sources, and this is expected to reach 80% by 2019. In Canada, wind power options have a signifi cant edge in effi ciency in the country’s northern regions due to the prolonged lack of sunlight during the long winters there. Glencore pointed to its Raglan nickel mine as an energy innovator in this sector. The mine is exposed to extreme Arctic conditions and is not connected to the local hydrogrid or the natural gas network. Energy is the mine’s second largest budget item, according to the company. However, it is in a favorable position for a wind power project, situated on a plateau 600 m high, with few trees in the surrounding area. A few years ago, Raglan began to measure the wind and investigate the engineering requirements and potential environmental impact of a wind turbine installation. The mine also undertook consultations with local communities and other stakeholders. The company gave the go-ahead in 2014 for the mine to implement wind power; the project was reportedly Canada’s fi rst industrial-scale wind power facility with storage. In its inaugural year, the project was reported to have saved 2.1 million liters of diesel and reduced greenhouse gas emissions by 5.85 kT. Glencore estimates it will save more than C$40 million in fuel-related costs over the projected 20- year life of the wind turbine. Hatch was a key player in the project, along with Tugliq Energy Co., owner of the 120-m-high utility-scale turbine. The project uses Hatch’s proprietary Microgrid Controller technology to monitor demand for wind power and smooth out wind power variations to displace diesel generation. And, well before the Raglan project got off the drawing board, the Diavik diamond mine in Canada’s Northwest Territories had been running with the assistance of wind power for two years. Four 2.3-MW turbines were installed there in 2012 with a capacity of 9.2 MW. The wind farm, which has achieved peak power penetration of 52% (one-half of the mine’s energy needs), began delivering power to the mine’s grid on September 28, 2012.
available in ratings from 220 kWe to 648 kWe. A recurring theme present in many of the recent industry announcements concerning interest in, or adoption of RE initiatives, is the concept of “optimization, not maximization,” a notion touched upon by Gold Fields’ Dr. Mthombeni at the previously mentioned ICMM webinar. In other words, instead of looking to RE for a total solution to a mine’s energy needs, mines are often better served by looking at approaches that most effectively utilize existing facilities and investments such as an on-site diesel-fueled power plant, along with RE support to ensure constant supply. This commonly takes the form of a hybrid system, which usually consists of two or more renewable energy sources used together to provide increased system effi ciency as well as greater balance in energy supply. Hybrid systems generally integrate well with RE sources, enabling users to set up microgrid power networks in remote locations. As an example, a newly commissioned solar power facility at Sandfi re Resources’ DeGrussa copper-gold mine in Western Australia was reported earlier this year to be generating approximately 7 MW of power, in line with seasonal expectations. Solar generating output will ramp up during summer months to achieve full 10-MW functional capacity. It comprises 34,080 solar PV panels with a single-axis tracking system mounted on 4,700 steel posts. This enables the panels to track the sun during the day, improving the plant’s overall performance. The panels are connected to a 6-MW lithium-ion battery storage facility and the existing 19-MW diesel-fi red power station at DeGrussa. The solar facility has been integrated with the diesel-fi red power station — owned and operated by Pacifi c Energy Ltd. subsidiary KPS — providing base-load power to the DeGrussa mine with suffi cient minimum load to ensure it can respond quickly to meet the power requirements of the process plant and underground mine. The solar array covers a total area of more than 20 hectares (50 acres) at the site, located adjacent to the underground mine and processing plant. According to the company, the $40 million project is the largest integrated off-grid solar and battery storage facility in Australia and, reportedly, in the world. Recognizing a need for fl exible power solutions, Caterpillar introduced its Cat Microgrid technology to the market last year, describing it as an innovative suite of power systems that adds solar panels, state-of-the-art energy storage, and advanced monitoring and control systems to Cat’s traditional line of power generation equipment, including generator sets, switchgear, uninterruptible power supplies and automatic transfer switches. Caterpillar said it had proven the real- world value of its microgrid technology by commissioning a system at the company’s Tucson Proving Ground in Arizona, USA. Last year, facility managers installed 500 kW of photovoltaic solar power along with 500 kW of short-term energy storage in the form of batteries and ultracapacitors to supplement power that previously had been supplied solely by three 410 kW diesel generator sets. The integrated system is expected to reduce fuel consumption by approximately 33%. 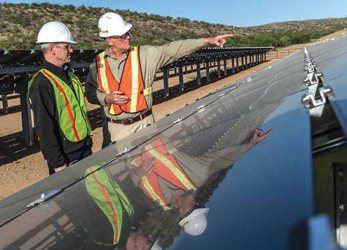 To support the development of Cat Microgrid technologies, Caterpillar said it had over the past year invested in metal- air battery developer Fluidic Energy for energy storage; signed a strategic alliance with First Solar for an integrated photovoltaic (PV) solar solution; and made an equity investment in Powerhive, an energy solutions provider for emerging markets. Another compact hybrid system for solar–diesel microgrids was introduced by Copenhagen, Denmark-based Danvest in 2016. The company, which has been active in developing wind-diesel hybrid power systems, said its Compact series offers power producers a complete, cost-effective solution that automatically integrates photovoltaic systems with diesel power. 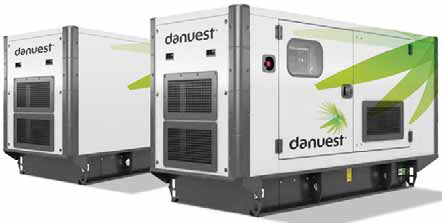 The Compact series includes Danvest’s low-load and reverse-power operation and fast-response capabilities. Direct annual fuel savings are typically 30% to 40%, according to the company. The system is able to run on 100% solar power during the day, when solar radiation is highest, and its generator sets are capable of quickly responding to drops in solar output or increases in power demand. In other words, said the company, it acts as an active spinning reserve with nearly zero fuel consumption. This system also is based on standard Caterpillar generator sets, comes in sound-attenuated enclosures, and is equipped with Danvest’s low-load technology and its control- and power-panel system with dump-load controlling. Storage systems and additional solar capacity can be added to further increase overall performance. Four standard Compact hybrid power modules are available as plug-and-play elements ranging from 220 kWe to 648 kWe ratings.